Auditioning may be a brand new experience for your young singer—and for you! We’ve put together the answers to the questions we hear most often so you can get the information you need right now. Of course, if we haven’t addressed your concerns here, please contact us. We’re always happy to help and to answer your questions. Is prior vocal training and experience required to be a part of CCC? An audition sounds scary. What goes on in the audition? What are the uniform requirements, and what is the cost? I noticed that singers must be seven years old before their first rehearsal. Do you have any advice for my four-year-old who loves to sing? We do not require experience for singers in our Junior or Encore choirs. We actually prefer singers without voice lessons because we want them to come with a natural, pure, childlike singing voice. We hold auditions so we can meet one-on-one with the singer and parents and to conduct a wide assessment of their vocal abilities. It helps us establish their level of note reading, ear training, rhythm, and range. We help singers through every step, so it feels more like a short music lesson and shows them what all they will learn throughout the year. The minimum requirement for a Junior Choir singer is to match a note with their voice. Junior choir goals include extending range, singing with beautiful tone, starting to read music, learning early solfege, and experiencing a variety of age-appropriate music. There are two types of uniforms for CCC events, and we will notify you before each event which one your singer should wear. Casual Uniform: CCC t-shirt, tan bottoms, socks, and sneakers. This is our uniform for national anthem performances at athletics events, park performances, and full-day camps or festivals. Formal Concert Uniform: Formal dress for girls or dress shirt and pants for boys, dress shoes, and assigned accessories. With your assistance, a CCC uniform coordinator will fit your child for their formal concert uniform. These uniforms are for the winter and spring concerts, mid-semester concerts, and special performances. CCC t-shirts for the casual uniform are your child's to keep, while all formal performance attire with accessories are strictly for the duration of the season. The cost of these materials is included as part of the bi-yearly participation fee.You can download more uniform information here. Join a local church children's choir. Find a preschool that uses music and singing every day. Expose your child to the arts in many forms—theater, symphony, choir, dance—to be inspired by performances. Start your little one in piano lessons. One of the fastest ways for a young musician to learn and grow, the piano is physically easy to play, and your child can sing with the piano when he/she practices. This helps to develop pitch awareness and introduces your child to reading music. The best way to find a good piano teacher is to ask people you know for referrals. 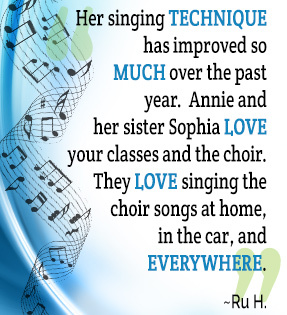 Attend a CCC concert so your singer can see what our group is about! Attend a CCC summer camp — open to singers age 6 and older—this is a great way to meet other choir children and our directors and staff. Sing at home! With mom, dad, siblings or friends! Sing, sing, sing!